Because aluminum sheets are lightweight and resistant to rust and corrosion, they are easy to install and are weather-proof. They also absorb shocks well, an important safety feature for automobiles in particular. Aluminum sheet is made from a wide range of aluminum alloys with different weights, strengths and resistances. Aluminum sheet may also be heat-treated in order to increase its heat resistance. Some companies may also produce prepainted aluminum sheets for utility trailer sides, sign blanks and other uses. The word “sheet” is non-specific, and it is used to describe a large variety of different aluminum shapes. An aluminum sheet can be as thick as a few inches or as thin as a foil. The word “plate” is more commonly used in reference to aluminum planes that are thicker than an inch. Aluminum planes of such thickness are quite heavy and are generally reserved for heavy-duty uses. Sheets, on the other hand, are generally thinner and can be used in applications that range from light to medium duty. Many aluminum sheets are thin and pliable enough that they can be rolled into coils for easier storage and transportation. Aluminum sheets are often cold rolled. Cold rolling is a cold metalworking process, which means that its products are produced at or near room temperature. The introduction of heat into metalworking processes can make the formation of metal shapes easier, but it can make metals susceptible to oxidation and other undesirable effects. 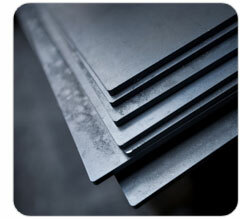 A wide variety of aluminum alloys is available for the construction of aluminum sheets. Aluminum 7075, for example, is considered to be among the stronger aluminum alloys. 7075 aluminum can be used in applications that demand a material with a high tensile strength and a low weight. 6061 aluminum is known for its mechanical qualities and its good weldability. Aluminum 1100 is among the purest aluminum alloys; it features an aluminum content of 99.6%. Each alloy offers different physical qualities, and each alloy is sometimes used in the construction of aluminum sheets. Aluminum Sheet Aluminum sheets are used to build a variety of products that are essential to housing, automotive, aerospace and nautical industries. For example, aluminum sheets are used to make siding and roofing for houses and body panels for automobiles, airplanes and boats.